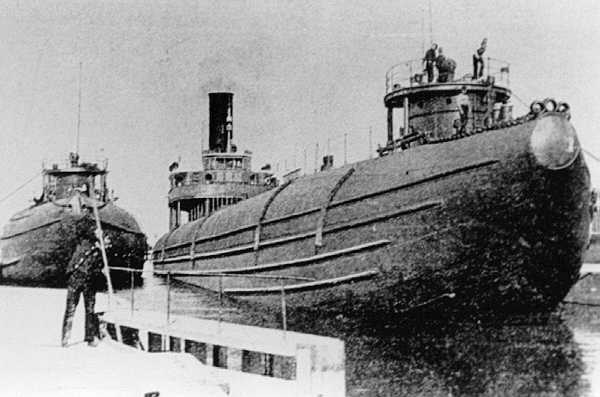 The whaleback Thomas Wilson was lost at Duluth on June 7, 1902 because of a series of blunders on the part of the crews of both the Wilson and the George Hadley, the ship that sank it near the entrance to the Duluth harbor. The Wilson was steaming out of the harbor, its holds filled with iron ore. The weather was clear and calm and the captain made the mistake of getting his ship underway before the hatches were closed. Meanwhile, the steamer George Hadley, laden with coal, was approaching the harbor from off the Wilson’s starboard bow. A problem developed when the skipper of the tug Annie L. Smith hailed the Hadley with orders to divert to Superior Harbor because all of the coal docks at Duluth were full. Without thinking, Captain Mike Fitzgerald, skipper of the Hadley, told his wheelman to turn to port. Whalebacks, by their very design, rode low in the water, especially when carrying heavy cargo. Obviously Captain Fitzgerald did not see the Wilson approaching from his port side. The skipper of the Wilson saw the Hadley’s turn and attempted counter measures. Because his boat was just outside of a dug channel he worried that a turn to port might put his ship aground. He ordered a turn to starboard, instead, hoping to divert the looming crash. The Hadley struck the Wilson as the two boats were in the midst of their turns. The whaleback was hit forward of the after hatch. The Wilson was a composite ship, built of both wood and steel. The wooden bow of the Hadley forced the Wilson to heel on its port side, and water quickly filled the holds through the open hatches. By the time the Wilson righted itself, it was already sinking by the bow. It sank in just three minutes, taking nine of the ship’s 20-member crew down with it. The Hadley also was severely damaged and leaking so badly, it barely got into shallow water and beached at Minnesota Point before it also settled. A Board of Inquiry found Captain Fitzgerald to blame for the accident and took away his license. 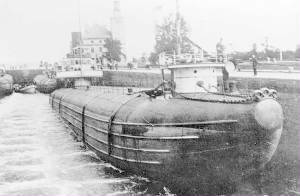 The Hadley was salvaged and rebuilt as the William P. Rend. The Rend foundered in 1917. Attempts to raise the Wilson failed. The wreck still lies where the ship sank, about two miles off Duluth harbor.